Dedicated to building exceptional leaders from the schoolhouse to the statehouse, the New York City Leadership Academy provides educational opportunities for educators and students alike to thrive. On the cutting-edge of educational leadership and equity, NYCLA is redefining success for aspiring leaders everywhere. In aiming for a more educational feel, we chose Lora font to convey striking headlines throughout NYCLA’s website. To best communicate the highly informative body copy, we chose Source Sans Pro for a clean, engaging and legible font even when used in lengthy paragraphs. Success for NYCLA means better education in our country by building the capacity of great educational leaders one school district at a time. With an outdated and tough to navigate website, NYC Leadership Academy approached us with the need to tell their story the right way. We were tasked with creating a visually stunning website with comprehensive content for prospective stakeholders to learn about how the academy trains and places future leaders and how others can take part in this great initiative. Strengthening an organization that empowers leaders to excel means being a driver of success for nationwide student education. Developed out of the need for stronger school leaders, our ultimate goal was to position NYCLA as the innovators and industry leaders that they are. 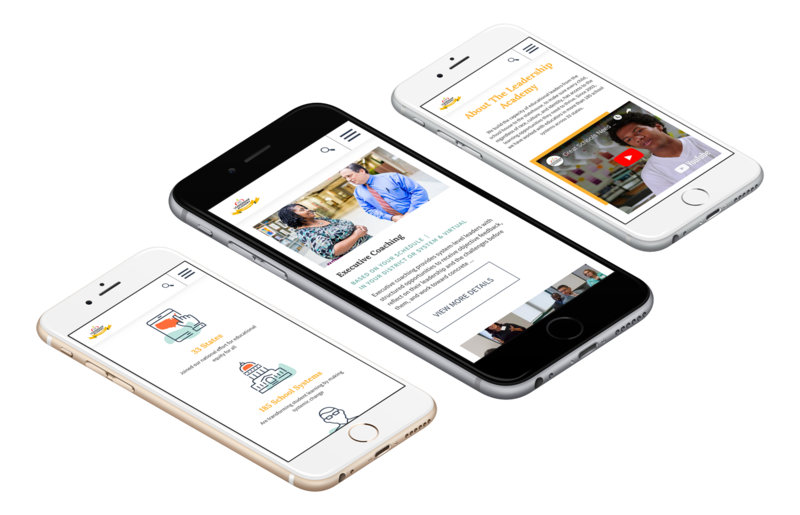 We communicated their impact with ease of access to content, donations, and services offered. By showcasing marketing collateral, relevant statistics, categorized workshops, resources, and tools, we demonstrated NYCLA’s far-reaching success. 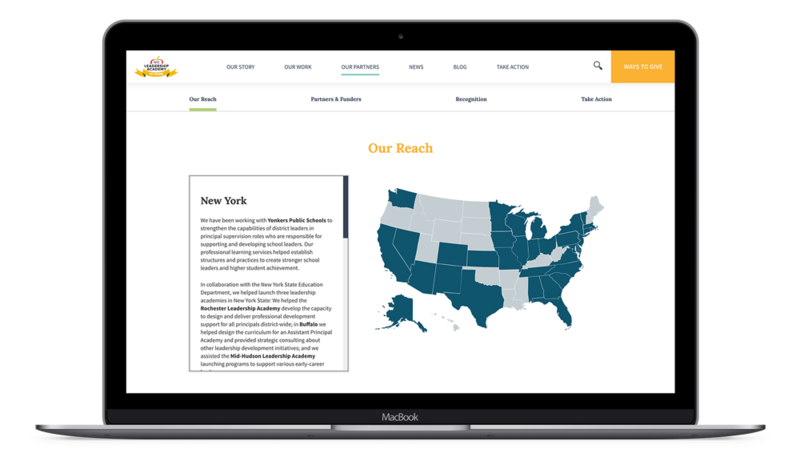 We created an interactive map showcasing NYCLA's impact across the country, with a seamless experience across all devices. Representing the grand scale of their organization, we made sure video and image assets were just as impactful on smaller screens. We are proud to partner with an organization whose mission is to build the capacity of leaders nationwide and dismantle inequities in educational settings. Inspiring a new generation, NYCLA continues to train, place and empower educational leaders across the country, directly impacting the students they teach. Creating a model and environment where students can thrive and succeed without limitation is a mission we are honored to support.